I've been waiting to see this dress! Angelic Pretty are finally releasing Harlequinade. I think it's cute but to be honest I think I only like the pink and blue version. The other colors just feel really unappealing. I think my favorite cut is the jsk with the V shape on the bodice, the detailing looks really nice. I really want to see what this print looks like in real life because its really hard to see what the print looks like. The skirt looks kinda wonky, the sheer overlay on it is really confusion to me. Its a pretty dress but I'm pretty disappointed in the colorways. 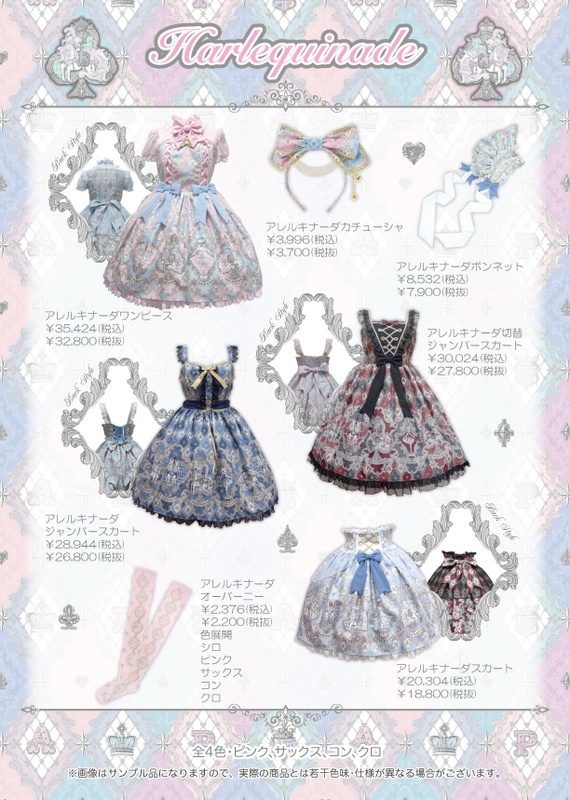 Angelic Pretty: 7 New Upcoming Releases! Angelic Pretty: Wrapping Cherry Special Set!